In 2017, Bo and Jessica, a couple in their 30s, welcomed twin boys into the world. They were loving parents, but the couple had a problem, an all too common one in today’s world: they were addicted to opioids. That addiction led to trouble later in the year when both Bo and Jessica were separated from their children following an arrest on drug-related charges. What could have been a dead end for the couple, though, turned into a new beginning thanks to an innovative court pilot program offered in Coffee County, as well as six other Tennessee counties. The Safe Baby Court program is dedicated to ensuring the welfare and secure placement of children who come under court jurisdiction. Since many children are placed under court jurisdiction because of their parents’ substance abuse disorders, Safe Baby Courts typically work on rehabilitating parents so that families can be reunited. 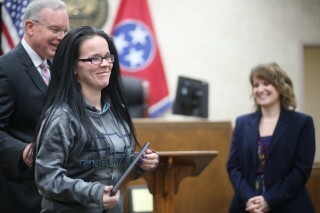 Bo, Jessica, and another local mother became Tennessee’s first three Safe Baby Court graduates recently during a ceremony in Coffee County General Sessions and Juvenile Court Judge Timothy Brock’s courtroom. Tennessee State Senator Ferrell Haile (R-Gallatin) also spoke at the event. Senator Haile has been instrumental in establishing Safe Baby Courts in the state through the passage of legislation and through his own enthusiastic advocacy efforts. Holding their sons, Bo and Jessica each expressed gratitude for the opportunity they had been given by the Safe Baby Court program. By the time Bo entered the program near the end of 2017, he had been an opioid addict for nearly 20 years. Now, he has been clean for almost 15 months. The Coffee County Safe Baby Court was established by legislation in 2017 that also created programs in Johnson, Knox, Madison, and Stewart Counties. The state’s first Safe Baby Court was started in Davidson County in 2015. Another started shortly after in Grundy County. Coffee County Juvenile Court Magistrate Stacy Lynch explained the purpose of the Court in a video produced by the Tennessee Department of Mental Health & Substance Abuse Services. The way to stop that cycle, which has grown more powerful with the rise of the opioid epidemic, is to provide the parents of at-risk, younger children with resources that they can use to turn their lives around. “The goal of Safe Baby Court is to give them a support system and give them the tools necessary so they will make lifelong changes that will affect not only their success but their families’ success,” she said. There are a number of requirements that must be met before someone participates in a Safe Baby Court program. For instance, participants must have at least one child who is zero through three years old; they must have an open case with the Department of Children’s Services; and they must voluntarily agree to be part of the docket. The Safe Baby Court program does not have a definite duration for participants. Rather, court staff and the presiding judge and magistrate track the progress of enrollees over a period of months as those enrollees do things like attend support group meetings, take life skill and parenting classes, and receive mental health therapy and counseling. Parents are also granted increased visitation with their children during their time in the program, in an effort to encourage healthy parenting skills and keep family bonds strong. Bo and Jessica graduated after prolonged participation in an intensive outpatient program, consisting of two to three meetings per week, and regular attendance at twelve-step program meetings. They are now involved in a six-month aftercare program. The results of all that hard work have been life-changing. Jessica hopes that others will learn from her and Bo’s experiences and give Safe Baby Court a chance. Bo agrees. Safe Baby Court gave him the power to improve his own life, and his kids’ lives as well. Note: All Safe Baby Court participants consented to have their photographs taken in court. One of the Safe Baby Court graduates receives her diploma during the graduation ceremony.